Like many acute care facilities, the medication reconciliation process at Sebasticook Valley Health was time-consuming and inexact. Their existing feed frequently couldn’t match patients, and medication information was missing. 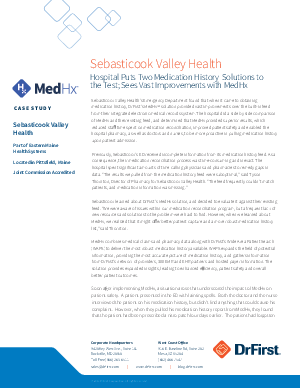 Sebasticook Valley Health’s Emergency Department did a side-by-side comparison of two medication history solutions and found DrFirst’s MedHxSM solution provided vast improvements over the built-in feed from their integrated electronic medical records system.